Corruption in Afghanistan has doubled in the two years since 2007, according to a survey by anti-corruption charity Integrity Watch. Afghans paid nearly $1bn (£658m) in bribes in 2009, with almost a third of those surveyed saying they had had to pay a bribe to obtain a public service. More than half said state corruption was fuelling the Taliban's growth. The average cost of a bribe was $180, which can be many months salary in one of the poorest countries in the world. 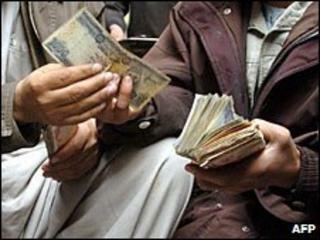 Bribes are required for everything from access to healthcare and education, to obtaining a passport or identity card. The police and the judiciary are viewed as most corrupt by the 6,500 people surveyed. But despite the insurgents capitalising on government corruption, the vast majority of people in the country looked towards the president and other state institutions to bring it to an end. And Afghans are just as concerned about corruption in their country as the international community. The survey says that bribery is not part of Afghan culture, and that 90% of respondents said they felt guilty when paying a bribe.